Originally published in April 2005, on my original 52 Books blog. 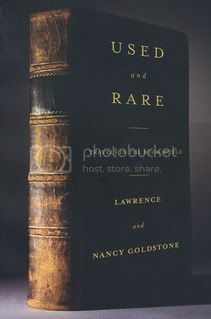 I read these two books by Lawrence and Nancy Goldstone one after the other. The first, Used and Rare: Travels in the book world, is about why and how they started accumulating a library of used books, how they gradually began to understand the language of book collecting and recognise the value of books, and how their collecting escalated until they were buying expensive first editions, and how they finally came to their senses and decided it was more important to get good reading copies of many favourite books than to spend thousands of dollars on a few first editions. This is a charming book about the development of a hobby that the authors show can be both affordable and enjoyable, even for people of modest income, as long as they don’t get carried away with first edition fever. 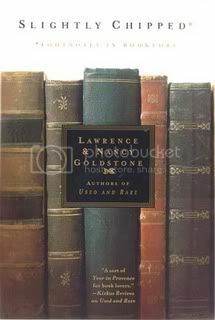 The second book, Slightly Chipped: Footnotes in booklore, which on the dust jacket is somewhat pretentiously called a “companion piece” to the previous book (it is fact an ordinary sequel), is about their continuing interest in books, friendships made through book-collecting, and adventures, such as when they attended the Edgars (mystery book awards) and the auction of the estate of the Duke and Duchess of Windsor. This book is padded with pages upon pages of information about authors and book trivia, and one gets the impression that it was written in haste. Some of the charm of the previous book is still there, but this book is not as solid a piece of work. Call me grumpy, but I thought books had to be proofread before going into printing. I have never in my book-reading life come across as many typing and spelling errors in any book as I have in those two, errors that any decent computer proofing tool would have found. It is all the worse in book one because it is not a first edition and someone should have corrected the spelling errors before it went into paperback. The second book has rather fewer proofing errors, but the ones that there are, are much worse, terrible typing errors that have gone unnoticed at the proofing stage. Of course, should this book ever become collectible, this will probably make the first printing of the first edition more valuable, but that is no consolation to the poor reader who has to put up with the errors. For this reason I am withholding one star from each book, and giving Used and Rare 3 stars and Slightly Chipped 2 stars. I can only imagine what the manuscripts were like if that many errors crept into the published edition.